It has been said repeatedly - and accurately - that Penguins' goaltender Marc-Andre Fleury is the most polarizing athlete in the city of Pittsburgh. As a fan, you're either firmly in "MAF Camp" or you're just waiting for that next soft goal, that next miscue behind the cage or that next bad night to come to point out his negative tendencies. If you're in that second group, this is the season that you really only have the "wait until the playoffs" mantra to rely on because The Smiling One has all but eliminated half of the arguments that can be made against his performance. When first-year Penguins GM Jim Rutherford made the announcement that he had signed MAF to a new 4-year, $23 million contract on November 5th, the debate was renewed again. The lines had been drawn once again. The social media arguments began....once...again. Typically, when a player is awarded a new contract - and a raise at that - the results are not the greatest. Statistically, that athlete's relative stats will drop. Whether it is because of a change in the amount of pressure on that player or whether it's because of the need to outshine a player with a new contract by the opposition, the end results are typically the same: a momentary-at-best lapse in performance. Prior to signing the new deal, a deal that puts him well below the average salary for goaltenders of top-tier NHL franchises, MAF was cruising along as one of the best goaltenders in the league. He had played in 9 games prior to that trip to Winnipeg, going 7-2-0 along the way. Yes, the red-hot offense of the Penguins, led by the dominant first line of Sidney Crosby, Chris Kunitz and newcomer Patric Hornqvist, was scoring in bunches. The team was potting 4.2 goals per game. 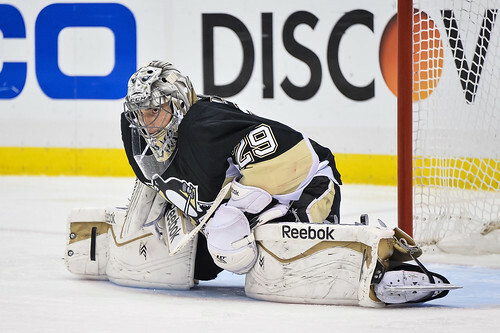 Fleury had posted a goals against average of 1.89 along with a .931 save percentage throughout that stretch. He was having a Top 5 Goaltender type season early. Signing the contract did not stop Fleury's success. 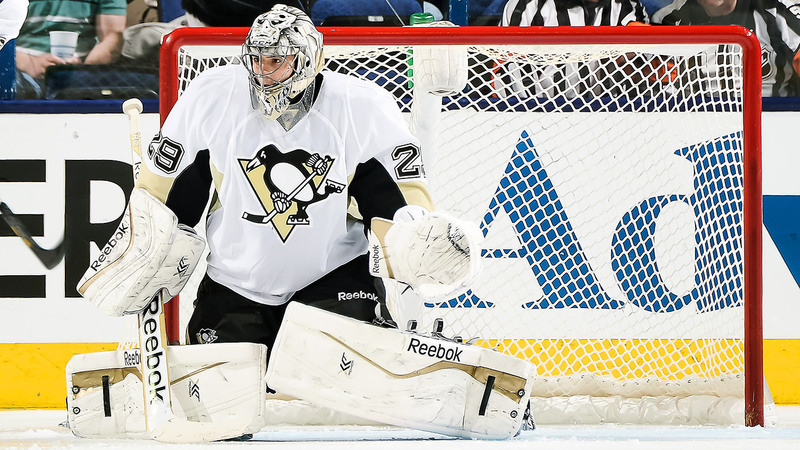 Since that deal was inked, Fleury has gone 12-2-2. His GAA over those 16 games increased marginally to a 2.01. Despite that increase, MAF's individual save percentage has gone the other direction. Since inking that deal in Winnipeg, he has been stopping shots at a .933 clip. For the season, Fleury only trails Nashville's Pekka Rinne among goaltenders with 20 or more appearances in both GAA (1.87 / 1.97) and save percentage (0.9330 / 0.9326). All the while, the Penguins lineup continues to function with a variety of call-ups replacing players that have been instrumental to the Pens' make-up. As a result of these injuries, the Penguins have gone from scoring 4.2 goals per game over the first 9 games to a much more "realistic" 3 goal per game pace. All while giving up more shots per game - 30.9 shots per game following the signing versus 27.4 per game prior to it - as the defense has been seeing as much shake up as the offense. But that's just this season. If you've not been paying attention, MAF has continued to improve his regular season play since winning the Stanley Cup in 2008-09. So much so, that we are witnessing a career year for Fleury that is Vezina-worthy to this point. Through 25 appearances, the numbers are through the roof for the 10th-yr goaltender. To give some perspective, I've compiled his stats through 25 games played, including games in which he was pulled and replaced another goaltender since that Stanley Cup season in 2008-09. If you're math deficient, MAF is on pace for 15 of these. After seeing what he's doing, there will be the crowd that will still argue with, "Just wait until the playoffs." But, in all seriousness, nobody gives a rat's behind about the playoffs until you're actually in the playoffs. MAF is not only a consistent bright spot in this lineup so far this season, he's often been the brightest spot and worth every penny that Jim Rutherford committed to him. Like it or not. We'll cross that "playoff bridge" when we get there. After MAF does his part - which is a major one - in getting them there. NOTE: 2008-09 saw then-head coach Michel Therrien replaced midway throughout the season by Dan Bylsma, 2012-13 was the NHL's shortened season due to the lockout and the 2009-10 and 2013-14 seasons had condensed schedules due to the Olympic Games.